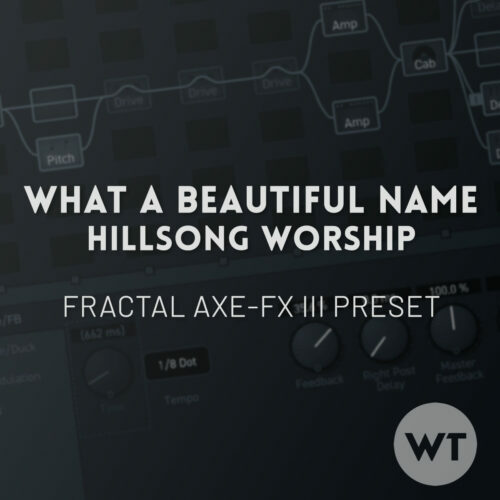 Fractal Audio Axe-FX III Preset for the song ‘What A Beautiful Name’ by Hillsong Worship. Includes scenes to replicate the different song sections and custom per-preset mapping and overrides for use with the Fractal FC-12. The preset is stock (no 3rd party IR’s required), and includes options for both single coil and humbucker equipped guitars. Includes the new reverbs introduced in firmware 3.0 and the new drives introduced in firmware 3.02! Requires firmware 3.02. UPDATE YOUR FIRMWARE: Please upgrade the firmware on your Axe-FX III. and make sure to use the latest version of Axe-Edit III before installing this preset. If your firmware is not up to date, this preset may not load. You can do this with the Fractal Bot software. EVERYTHING IS STOCK: This preset does not use third party IR’s. If you’d like to experiment with 3rd party IR’s, feel free to do so in the cab block. FC-12 FUNCTIONALITY BUILT IN: This preset was built to work with the Fractal FC-12 and an external expression pedal plugged into the ‘Pedal 1’ input. See the Per-Preset overrides and FC assignments below. Input 1 (the Input Noise Gate is turned off to save CPU). NOTE: The ‘Volume’ parameter is mapped to ‘EXTERNAL 1’. This will allow you to globally choose what expression pedal is mapped to ‘EXTERNAL 1’. To set this up, go to ‘SETUP -> MIDI/Remote’. In the MIDI/Remote menu, navigate to ‘External’. From there, set ‘External Control 1’ to whatever you are using for your expression pedal. Channel A: Studio Comp: set to be somewhat transparent, general use comp. Channel B: Pedal Comp 1: Lots of compression and squish. Use this for funk and super clean stuff. Also gets the ‘Bethel sound”, especially on verby clean lines. Channels C & D: Not set up. Scene 1: INST/VS/CH. This is a 100% wet reverb tone with shimmer. If you pick lightly with the volume at 100%, you’ll get a pad effects like what you hear on the album. Scene 3: INST SWELL. Similar tone to Scene 1 for the instrumental section. Scene 4: BRIDGE BLD. Stage 2 overdrive with delay and reverb. Scene 5: CH BIG. Same as Scene 4 but with more drive. Scene 6: AMBI LEAD. This is a huge lead tone (thanks to a ridiculous amount of reverb). This will mimic the trill ambient lead part you hear on the album – best for a single note lead part, since this much reverb can get out of hand quickly. Scenes 7. Not used (if you click on it, you’ll get an ambient clean tone). Everything after the amp runs in stereo. If you are running mono, you’ll need to sum your signal to mono before going to FOH (if you only use the Left output, won’t hear some of the delays at all). In OUTPUT 1 CONFIGURATION (choose the physical output you are using), change the ‘Mode’. Select ‘STEREO’ if you are running in stereo. Select ‘’SUM L+R’ if you are running mono. This will convert your output to mono and sum the stereo image. This will also cause all your presets to output in mono, as it is a global setting. For most blocks, We’ve set up multiple channels to give you different options for any given effect. However, not all blocks have all four channels set up – some have just couple, and some only one. See the Signal Flow section above to see what is set up in what channel for any given block. All three drive blocks increase in gain as you go up, so Drive 1 is lower gain than Drive 2, etc. Within each drive block, all four channels are set up to give you different flavors of the same gain structure. Every guitar reacts differently with drives (and amps), so it’s good to have options. We’ve chosen our personal favorites within each block and left them in Channel A, but feel free to experiment with your setup to find what you like best. We’ve used all four channels of all four delay blocks (that’s 16 different delays!) . Each delay block runs in parallel with the others so the delays don’t run into each other. Delay blocks are separated into different delay times. For example, Delay 1 is four different flavors of quarter note delay, Delay 2 is all 8th note delays, Delay 3 is all dotted 8th noted delays, and Delay 4 is all stereo dual delays. Delay four is a bit different because each channel will give you different rhythmic delays, and Channel D is set to give you a huge wash for swells. We’ve set up reverbs the same way as delays – each reverb block contains four versions of the same type of reverb (normal and big). This preset integrates with the Fractal FC-12. We’ve set up Per-Preset overrides for both effects and scenes, and we’ve mapped them to Layouts 7 (Perform 1) and 8 (Perform 2). If you have an FC-12, the following assignments should be plug-and-play. Layout 7 will be your scenes and Layout 8 will be individual effects, plus swells. We recommending setting Buttons 6 & 12 on Layout 7 to Preset +/-1 inc/dec. This way you can cycle through your presets one at a time from Layout 7. If you’d like to change any of these assignments (either the Per-Preset Assignments or the Overrides), you can do so in the ‘CONTROLLERS’ menu on the Axe FX III. Press ‘CONTROLLERS’ from the Home screen, then select ‘Per-Preset FC Settings’ and make changes. If you would like to go back to your default settings for Layouts 7 and 8, you can reset the Overrides from the ‘Overrides’ menu in the ‘Per-Preset-FC Settings’ section. All guitars are different, so you may want to make changes to suite your playing style and guitar. The amp blocks are set up for single coils using Channel A and humbuckers using Channel B. NOTE: If you want to use Channel B of the amps, please be aware that you’ll need to change to Channel B in every scene, otherwise the scenes will switch the channels. You may prefer to create a duplicate of this preset and copy the Channel B settings into Channel A of the amp block. Input Drive (and/or Input Trim). If the clean sounds from this preset are too dirty, lower the input drive and/or trim. Do the opposite if you want more gain. This preset is meant to be on the edge of breakup at it’s cleanest settings (otherwise the drives won’t stack properly). EQ settings (amp block – basic). Once the desired gain staging is set, the next adjustment would be the amp EQ settings. Output EQ settings (amp block). The Graphic EQ on the amp block is a great way to make final EQ adjustments. We’ve set it to ‘Post P.A.’, which means the EQ settings will not be affected by the Power Amp section. The Axe FX III offers very useful tools to check overall level of individual presets and blocks. In the Output block you can monitor the overall output level. You can also monitor levels of each block individually from the front screen of the Axe FX. Level (amp block – basic). This will adjust the overall level of the preset up/down. Avoid using the ‘Master Volume’ control, as this will change the tone of the amp. Level (cab block). This will also adjust the overall level of the preset up/down.